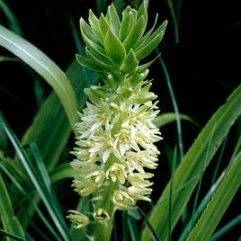 Eucomis is a genus of flowering plants in the family Asparagaceae, subfamily Scilloideae. Most species of this genus are commonly referred to as pineapple flowers or pineapple lilies. They are bulbous perennials with basal rosettes of leaves with stout stems covered in star-shaped flowers, similar to those of the pineapple - hence the common names. 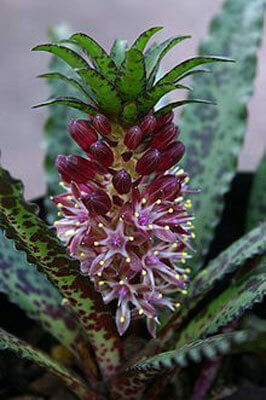 This is the South African species pineapple lily with the most gorgeous green and purple blotched leaf. In Autumn, the most beautiful 10cm high purple flower appears in the shape of a pineapple from the center of the plant. Height to 10cm. Width to 10cm. Winter dormant bulb. A true rarity.